← WINE TASTING! 40 wines sampled, 8 recommendations. 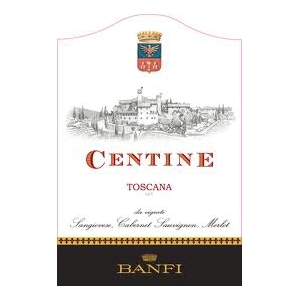 RECOMMENDED: 2008 [Banfi] Centine, Toscana (Tuscany), Italy. Red blend of Sangiovese (60%), Cabernet Sauvignon (20%) and Merlot (20%). $10.99; available for as little as $8.69. 13.5% ABV. The color: a clear, deep garnet. The aroma was fragrant throughout, and it kept changing subtly as it opened up. It had a backdrop of dark berries, of course, laced with cherry as well as whiffs of licorice, cinnamon, and just a bit of oak. Although medium-bodied, this wine came across with quite a bit of strength and complexity without being overbearing. This is a well-balanced, beautifully integrated, and smooth wine with a long finish—a classy wine with a lot of character. It has been referred to as a “Baby ‘Super Tuscan’” and we can see why! And, word has it that every vintage is just as good, so it’s likely to be a reliable choice as well as being a tasty and inexpensive one. LABEL NOTES: A royal cuvee of noble Tuscan grapes. Skilled viniculture heightens the charming characteristics of each varietal. Aged 6 months in French oak barriques; blended and matured an additional 12 months. Soft tannins and forward fruit. Ideal alone or with pasta, roasts, grilled meats or poultry. VINTNER’S NOTES: Our Centine takes its name from a 19th century farmhouse on the Castello Banfi vineyard estate. This rural Tuscan dwelling is noted for its many stone arches, called centine in Italian. Their appealing character is perfectly reflected in Centine’s solid structure and well-rounded elegance. [The Castello Banfi winery, located in the Brunello region of Tuscany, consists of several vineyards encompassing more than three dozen varying subsoils.] The estate is renowned for its clonal research that allows noble grape varieties to thrive in their optimal terroir, creating not only a consistently outstanding Brunello, but the ultimate expression of Montalcino Super Tuscans. Banfi is one of the world’s largest producers, with brands such as Riuniti, Concha y Toro (including Frontera), Natura, Bolla, and Walnut Crest in its portfolio, along with some more interesting labels such as this one. A Centine Rosé is also made from the same blend of grapes. Sounds like it might be a refreshing summer choice. We’ll pick some up, put it through its paces, and let you know what we think. Also on our must-try list is another Banfi brand, “Trio.” All the affordable Trio blends have earned glowing words and strong recommendations. WINE SPECTATOR: A fruity red, with clean currant and blackberry character on a medium body. This has a pleasant finish, with a subtle coating of black olive over the light, velvety tannins. Sangiovese, Cabernet Sauvignon and Merlot. Drink now. 66,665 cases made. DAN BERGER’S VINTAGE EXPERIENCES: Rustic, earthy aroma with a rich layer of red fruit and solid acid … a reliable wine every year … Bargain of the Week. This entry was posted in Italy, Red Blend, Sangiovese. Bookmark the permalink.